Absolute Fitness creates customized fitness programs that are tailored to your individual goals, fitness level and any limitations that you may have. We design our programs with all aspects of your daily life in mind, nutrition, exercise habits, and stress and sleep levels. After your program is designed, your trainer will be with you every step of the way giving you the guidance and support you need to be successful in achieving your fitness goals. Our private training facility is a full size, key code access gym that is only open to our clientele, meaning that we don’t sell memberships to the general public. Eliminating general memberships allows us to create the perfect, non-intimidating, supportive environment to finally achieve the results you seek. We allow our clients to access the gym, even on their days off from their trainer, so there is no need for a gym membership. We don’t charge any additional fees for gym access, as long as you train one hour a week with one of our trainers. We don’t do contracts or sell sessions in packages, just pay as you go. All sessions that are scheduled with your trainer must be paid for at the beginning of the week or at the beginning of each session. * All sessions that are scheduled with your trainer must be paid for at the beginning of the week or paid for at the beginning of each session. Every package includes initial fitness assessment and diet counseling. Fitness assessments are done every 3 weeks during the entire program. Want to train with a friend? Double training sessions are a great way to keep each other motivated. We do double sessions at just 1.5 times are regular rate. Sharing your session with a friend is a great way to keep your training more cost effective and to help each other stay motivated and focused to achieve your goals. Need a gift idea? Need a unique gift idea? Give the gift of fitness! 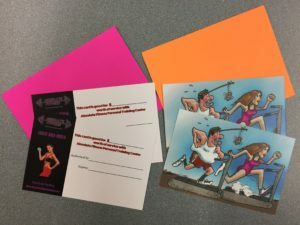 Absolute Fitness now offers gift certificates. Perfect gift for a loved one or the hard to buy for person. Available in any amount.